Here we are heading into winter and I feel my first cold coming on. The timing seems right to find a new hand sanitizer that is all natural. The makers of Clean Well sent me some samples of their product (which comes in a spray and wipes). It uses an all natural, plant based antimicrobial called Ingenium. Ingenium is a patented formula of botanical plant oils which can kill 99.99 % of germs which make you sick. From what I can tell on the package, thyme is a principal ingredient. It contains no alcohol and no harsh chemicals. It is made from plants which are readily renewable and available. No pesticides, irrigation or fertilizer are used, either. The company also mentions no petrochemicals or toxic bybroducts resulting from the harvest or distillation. The wipes are also biodegradable. You may remember my post about camping last summer where I mentioned that using hand sanitizer and wipes were some of the things I had yet to resolve in my greening of the camping routine. Voila! I think I'll be packing Clean Well next summer. I have to admit I was suspicious since they contacted me (this kind of marketing happens a lot with blogs). I showed the product to the saleswoman at the Whole Foods Whole Body department and she said the ingredients looked really clean. 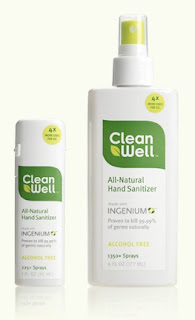 I also wrote Clean Well and asked them if I should be concerned about this killing too many germs - you know the whole thing with antibacterial soaps actually making bacteria stronger and stronger? They replied, "All of the ingredients are derived from plant oils. Plant oils have been disinfecting naturally for 1,000s of years and there is no indication that these ingredients are tied to bacterial resistance." And to be clear, while I did get some samples I do not get paid to mention products on my blog and I do not accept advertising. I just write about things that I honestly find helpful on my green journey. I found this at Target a couple of weeks ago and it seemed good to me, also. It was the only one left on the shelf so hopefully others are using it, too!